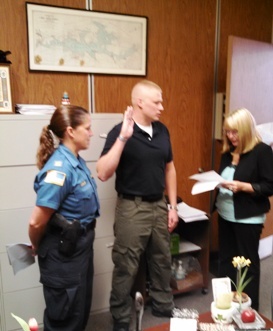 Daniel Kern sworn in to the Hopatcong Borough Police Department. Photo courtesy of the Hopatcong Borough Police Department. In March of 2012 the Hopatcong Borough Police Department hired Police Officer Thomas Snyder off of the RICE Bill list. (A list of police officers who have been laid off). Officer Snyder had been laid off as a Sparta Township Police Officer. In June of 2013 Officer Snyder graduated the NJSP 14-week K-9 academy with Eli who is trained in narcotics detection. The township of Sparta approved the rehiring of police officers and Officer Snyder was asked back. K-9 Eli will not be going to the Sparta Police Department with Officer Snyder. At the time of this press release The NJ State Department of Corrections might be taking K-9 Eli. On 08/07/14 The Borough of Hopatcong swore in Police Officer Daniel Kern. Officer Kern had been an Andover Township Police Officer for 9 years. Through the intergovernmental transfer program Officer Kern was able to transfer from the Andover Township Police Department to the Hopatcong Borough Police Department. 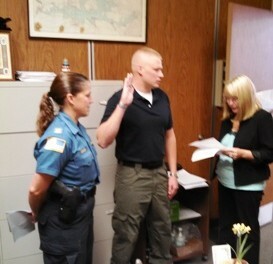 The picture is of Officer Kern getting sworn in by Borough Clerk Catherine Gleason and Captain Tina Kraus. Officer Kern was in his range clothes because he needed to qualify with his duty weapon before he starts his training tomorrow. A more formal swearing in will take place later this month.